Motorcycle jacket? Too cold outside at 44 degrees, and that would have made for a chilly walk to work. Studded heels? Nah, I didn’t feel like hobbling into work with blisters. Pleather leggings? YES! That is exactly the piece of clothing I was looking for. Pleather, also called vegan leather, is the affordable, more comfortable version of leather. It’s definitely having a moment in fashion. 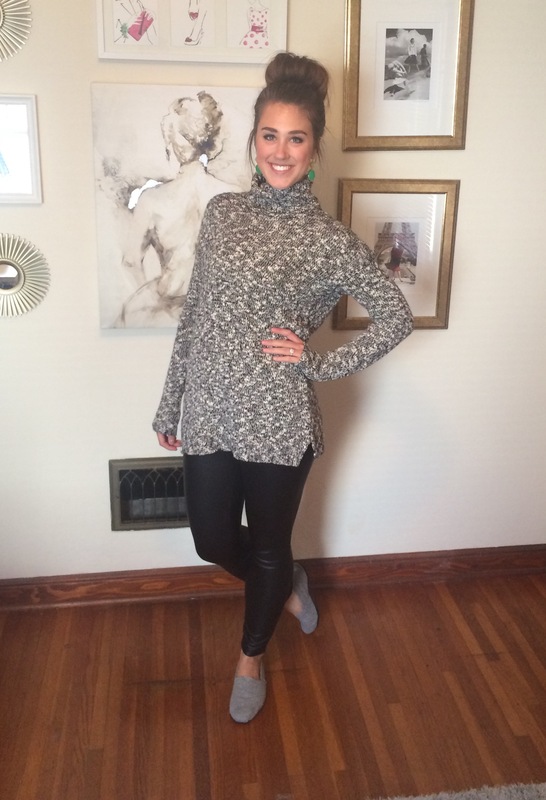 The fabric is fun and versatile, especially in the form of leggings. Plus, anyone can wear it! It’s stretchy and breathable, unlike its leather counterpart. To keep your outfit office appropriate, rather than date night out, pair with more casual pieces- oversized sweaters, subtle sparkle, flats, etc. I paired a geometric fringed sweater from Forever 21, black pointed flats from DSW, and subtle gold accents with my pleather leggings. The casual pieces toned down the fabric edginess. Another option is an oversized turtleneck sweater. Why wear typical jeggings or plain leggings? So expected and typical. Instead I spiced up the outfit with sneak peek of pleather- mixing conservative and classic with a little excitement. 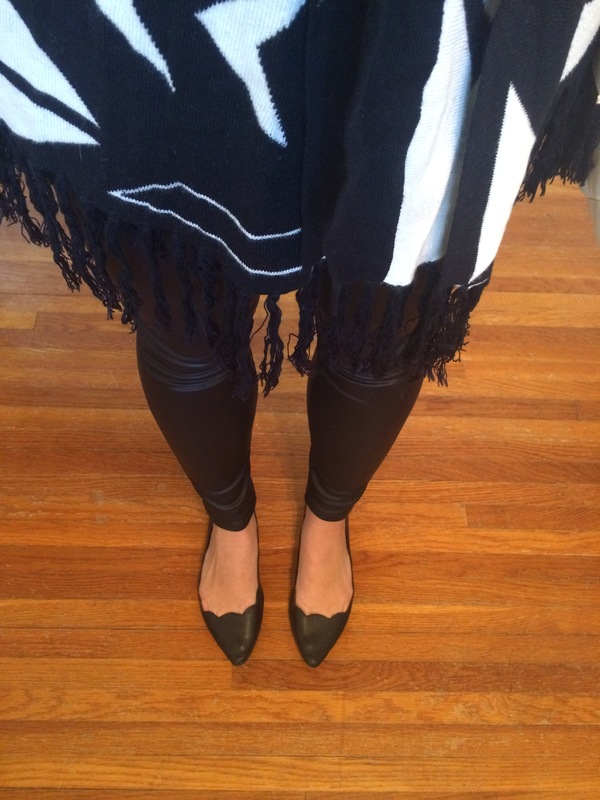 My Bar III pleather leggings were a recent purchase from Macy’s on clearance, and have become a staple in my closet. So, don’t be scared of pleather leggings. Yes, you can wear them! Next > More clothes = more exercise? They were definitely worth buying, especially now that winter is approaching- much warmer than typical cotton leggings, and more stylish, too.